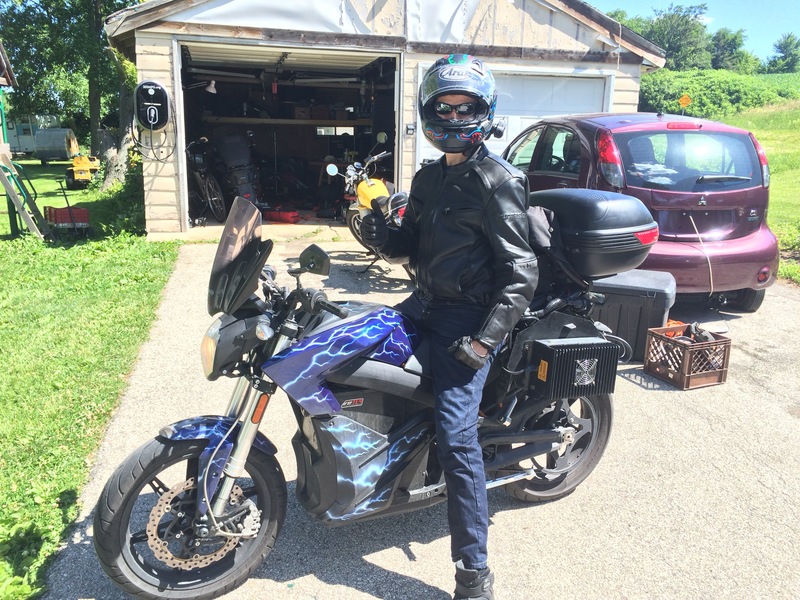 About the only thing as much fun as a long-distance trip on an electric motorcycle is a friend stopping by who is ON a long-distance trip on an electric motorcycle! On Tuesday, I was fresh back from the MREA Energy Fair when Ben “Benswing” Rich stopped by my house. He’s out on tour this summer on his electric motorcycle. (You can read all about it at http://www.benswing.com) As he’s doing so, he’s stopping at some very cool locations and events…. and also my garage. I was at home when Ben pulled up. Fortunately, I caught the reflection of his cycle in a mirror, through a window, zipping past. Electric motorcycles are so quiet that there’s definitely no VROOM-VROOM to announce themselves to the entire neighborhood – which is especially nice coming and going early in the morning and late at night. Ben was all geared up in black leather and fancy biker pants. First things First. We plugged in the motorcycle. Rule number one of long distance riding is to ALWAYS plug in the motorcycle BEFORE doing anything else! One time, I was at a campground and a guy came over to me to start asking questions about my Vectrix. We chatted for a little. 45 minutes later, I realized that I hadn’t even got the chance to plug in my cycle before we started talking! Lesson learned. Plug in first. Ben has 3 chargers on his bike – two 2500 watt chargers mounted in saddle-bag position, and a 10,000 watt “Super-Charger”, (and the bike’s stock charger!) The limiting factor in how fast the bike can charge is really based on how much electricity he has access to! I always thought of my garage as being pretty good as far as power goes. I have a 50 Amp NEMA 14-50 plug (popular at RV Parks!) along with a 6.6kW J1772 charging station. Ben plugged in to both at the same time. We got to talking about the joys and challenges of long-distance riding, and even shot a quick video overview of Ben’s charging setup. Unfortunately, I found out that although I have quite a few circuits in my garage, I’m limited by the main fuse! My panel has a 50A/240V or 100A/120 main breaker. Doing the math, that’s 12,000 watts. I checked the T.E.D. 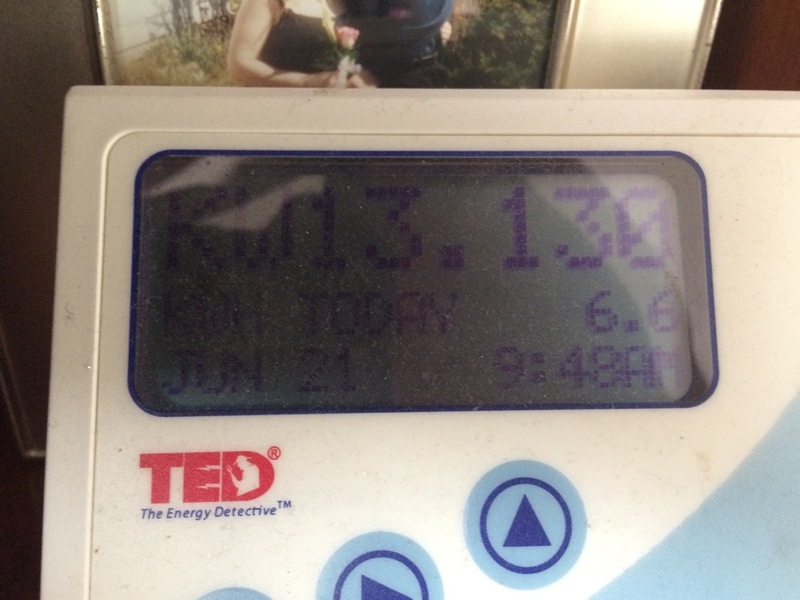 whole house energy monitor, and it was reading over 13,000 watts for my whole property! It didn’t take all that long until my garage main breaker popped. Ben turned down the power on his charger a bit, then we flipped the breaker back on, and the bike continued charging.That got me interested in how much HEAT was being made by all that current. 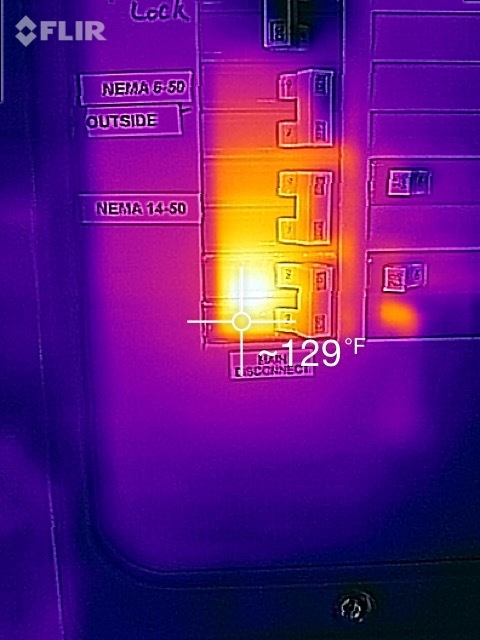 I had my thermal camera handy and shot a few stills of the breaker box, Ben’s bike, and his charger. We even shot a little thermal video. Nice writeup! Just to clear up one thing, Ben Rich’s side-mounted chargers are Elcon 2500’s by Hollywood Electrics which emit 2500W each, not 3500W. 6300W total from the Elcon system is possible because it’ll be feeding the onboard charger, too.